The old Smithwick’s brewery in Kilkenny, and the Harp Lager plant in Dundalk, are both to close with the loss of 100 jobs. The Guinness brewery at St James's Gate will be given a €153m investment - but plants in Kilkenny and Dundalk are to close. DIAGEO IS TO cut 100 jobs by closing breweries in Kilkenny and Dundalk – while creating 300 new construction jobs by investing €153m in its flagship Guinness brewery in Dublin. The brewery in Kilkenny will shut by December 2013, while the Dundalk plant will close in 18 months. The two plants manufactured Smithwick’s, Kilkenny ale, Budweiser and Harp Lager. Irish brewing operations will be concentrated at the flagship Guinness brewery at St James’ Gate, close to Kilmainham in Dublin. The plans include a new brewhouse on the Victoria Quay side of the complex, with a capacity of around 7 million hectolitres (around 1.5 billion pints) with associated grain intake buildings and an extension of the current fermentation plant. Guinness says the construction of the new larger complex at St James’ Gate will provide 300 jobs during the construction phase, and says the news underpins Diageo’s commitment to Ireland. Jobs minister Richard Bruton welcomed the announcement saying it was a “huge vote of confidence” in Ireland, and secured Diageo’s brewing operations in Ireland “for decades”. 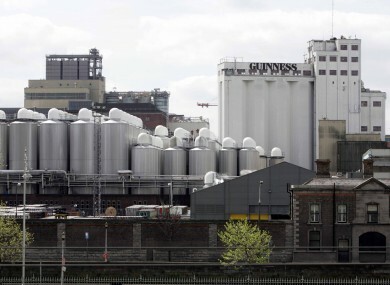 The move comes over three years after Diageo first announced plans to close the Kilkenny and Dundalk breweries, though in 2008 it had also proposed to cut production at St James’s Gate and move to a new greenfield site in Leixlip. That €650m programme was shelved in 2009 after the property crash. Email “100 jobs to go as Diageo centralises brewing in Dublin”. Feedback on “100 jobs to go as Diageo centralises brewing in Dublin”.